Maple leaves. Credit: Steve Jurvetson. The leaf is the organ of a plant which is primarily responsible for photosynthesis and transpiration. A typical leaf consists of a flat blade or lamina, and a stalk, known as the petiole, connecting it with the stem. There is not always a stalk, however – in which case the leaf is said to be sessile. Large-leaved plants such as rhubarb have large petioles. The slightly swollen part of the stem where the leaf arises is called the node. Each node may bear one or more leaves which are arranged in such a way that none is overshadowed by another. The angle between the leaf and stem is called the axil and normally contains a bud. The form of the junction between leaf and stem varies in different types of plant. The leaf base sometimes even surrounds the stem. Leaves that arise in a group from small underground stems (e.g., the primrose or plantain) are called radical leaves and are said to form a rosette. The first leaves of a plant to develop are the cotyledons or seed leaves. These are present in the seed. Flowering plants are divided into monocotyledons and dicotyledons according to whether there are one or two leaves respectively. The cotyledons do not always come above ground when the seed sprouts and if they do they are usually unlike the later leaves. Running across a leaf are a number of ridges or veins which indicate the position of the conducting strands carrying water and food materials. In dicotyledons the veins form a network, but those of most monocotyledons run parallel to each other without forming a network: they show parallel venation. Monocotyledon leaves are usually long and fairly narrow, e.g., those of grasses, irises, and daffodils. Leaf shapes of dicotyledons, however, vary enormously according to the arrangement of veins and the development of the lamina between them. If the margin of the leaf is smooth – as in the privet leaf – it is called entire, but more frequently the edge will be toothed (dentate) to some degree – the lamina does not develop completely between the major veins or branches. This condition reaches its peak in compound leaves where each major vein or branch has a separate lamina or leaflet. If there is one major vein – the continuation of the petiole – the compound leaf is pinnate (e.g., ash and rose). When there are several major veins each with a leaflet the compound leaf is called palmate (e.g., horse-chestnut). At the base of the petiole there are frequently stipules. These are outgrowths which vary in form from green leaf-like structures (e.g., in the rose leaf) to tiny scales or sometimes spines. Internally the petiole is like a small stem. Vascular tissues convey water and food between leaf and stem. Strengthening tissue surrounds the conducting vessels. The lamina is covered with a waxy non-cellular film (the cuticle) which is normally thicker on the upper surface than the lower. The epidermis (one cell thick) may or may not carry hairs. Scattered all over the lower surface and appearing occasionally on the upper surface are tiny pores called stomata (singular: stoma), through which water vapor, oxygen, and carbon dioxide pass into and out of the leaf. The stomata are bounded by special cells (guard cells) which are sensitive to air humidity and control the opening of the pores. Beneath the upper epidermis is the palisade layer of rectangular cells which contain many chloroplasts. These are "packets" of chlorophyll which gives the plants their green color, and in which the process of photosynthesis is carried out. 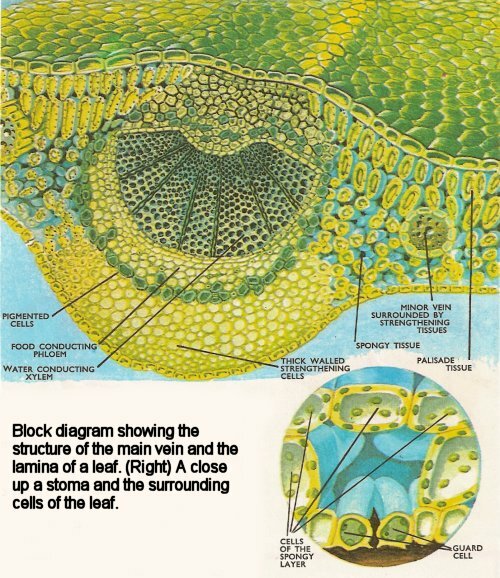 The spongy layer contains irregularly-shaped cells and many air spaces which connect with the stomata. The veins run through the leaf tissues carrying water and food materials. The xylem is on top of the phloem and there is usually some strengthening tissue on each side of the vein. Leaves which stand erect (e.g. daffodil) usually have stomata distributed on both surfaces and palisade tissue on both sides. Leaves that survive the winter (evergreens) and those of plants in desert regions have thicket cuticles and are modified to withstand drought; the stomata are protected by being sunk into pits or by the curling of the leaf. evergreen leaves also have more strengthening tissue to withstand high winds. Leaves are periodically replaced in all plants – even in evergreens and tropical trees, but in these cases the leaves are not all shed at once. Only the deciduous trees lose all their leaves at one time. When a leaf is to be replaced a corky substance forms between it and the stem. When this corky absciss layer is complete the leaf is connected to the stem only by the vascular (conducting) tissues. These snap in a wind or after frost and the leaf falls, leaving a scar on the stem. 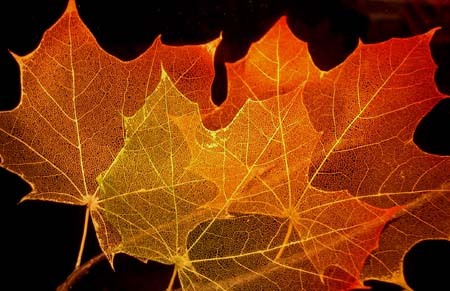 Leaf fall is thus a living process involving the formation of special tissues. Dead branches do not shed their leaves. Before leaf fall the leaf often assumes rich colors – the reds and golds of autumn. These are associated with chemical changes which accompany the removal of food material from the leaf. The typical flat green leaf is often modified for other purposes. The plants known as succulents have thick fleshy leaves which act as water stores for the plants, which usually live where there is irregular rainfall. Leaves for food storage are found in bulbs (e.g., the onion) whose fleshy leaves are food for the next season's growth. tendrils are climbing organs which twine around supports. They may be modified stems, leaves, or stipules. Those of a sweet-pea are modified leaflets of a compound leaf. Plants which trap insects to increase their food supplies have specially modified leaves which attract and trap the insects. leaves may be reduced to spines (e.g., in the gorse) where the stem takes over the photosynthesis of food. Young gorse plants, however, have normal leaves. The small scales found on winter buds (e.g., the horse-chestnut) are also modified leaves and the petals and other parts of the flower are considered in the same way. Occasionally leaves are completely absent – the stem will then be photosynthetic, but in the grass pea the petioles remain and look just like blades of grass.